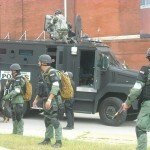 The American military is prohibited from deploying within the United States, but local law enforcement organizations are becoming increasingly militarized, as surplus gear from the Pentagon flows to main street. Even without military gear, the horrifying regularity of police violence against black and brown people continues unabated in marginalized communities. Over-policing and excessive use of force against protesters has resulted in deaths from the Haymarket Affair in 1886 to the student massacres at Orangeburg, Jackson State and Kent State to the bombing of MOVE and the siege at Ruby Ridge. The Federal Aviation Administration has authorized the use of surveillance drones in US airspace, and local police departments are beginning to purchase drones, armored personnel carriers, and other military equipment. 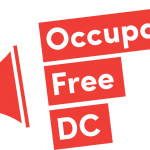 These tools can be used to carry out surveillance, invade privacy, and suppress nonviolent protests, threatening constitutional rights of Americans in jurisdictions from coast to coast. 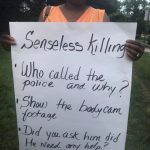 June 25, 2018 – A letter from six groups and over 600 residents raises concerns in the wake of the shooting death of Robert White, a black man who was killed about one mile from his childhood home in Silver Spring on June 11. He was killed while on foot near his neighborhood, which he walked routinely, according to neighbors. 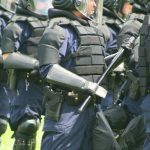 June 14, 2018 – This is the first time a court has addressed the legality of police use of a Long Range Acoustic Device (“LRAD”) sound cannon for crowd control purposes. 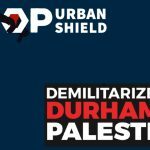 April 10, 2018 – From the Bay Area, California to Durham, North Carolina grassroots activists are scoring victories against police militarization.